Hawick’s Nicky Little has underlined the importance of beating Gala if the Greens are to be considered genuine BT Premiership contenders. The two rivals lock horns at Netherdale, tomorrow (Saturday), and given the recent results between the two sides, the prop expects the match to go right to the wire. Both previous meetings have been decided in the closing stages, with the away team coming out on top each time. Should that pattern continue, and it is a last-gasp penalty or breakaway try that seals victory, that will more than suit Little, who told the Hawick News: “This weekend is huge for us after losing that opening game. We can’t afford to lose another this early in the season. “Hawick v Gala games have traditionally been close affairs, just look at last year’s results, so the boys know we will be treading a fine line on Saturday. The mistakes we made against Melrose cannot be replicated this weekend, otherwise we could be staring at two defeats in a row which, frankly, for a side who have top four aspirations, is not good enough. 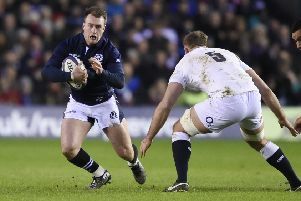 The Former Edinburgh rugby apprentice and Scotland under-20 star acknowledged last weekend’s loss to his former side Melrose was not an ideal start to their 2015 league campaign but despite now playing catch-up, the prop is confident the club will still be in the mix for a top four place. Little added: “[We’re] bitterly disappointed with the result from last weekend but we have to move on. It wasn’t the best way to kick off the season but there is still a real buzz around the whole camp.